With OPTIC-4 and the standard supplied control software Evolution Workstation it is possible to make a comprehensive two-dimensional gas chromatography setup. The OPTIC-4 Multi-Mode Inlet is a very versatile instrument, now with version 4.5.2 (or newer) from Evolution Workstation modulation control is available. The OPTIC-4 can be equipped with an auxiliary gas flow or pressure controller and a modulation valve. With this the control of a standard available flow modulator or a home-made flow modulator is possible. Evolution Workstation has a calculator to understand the flows and pressures needed for a good working flow modulation. With the OPTIC-4 control software (Evolution Workstation 4.5 and newer) it is now possible to configure two columns in series. 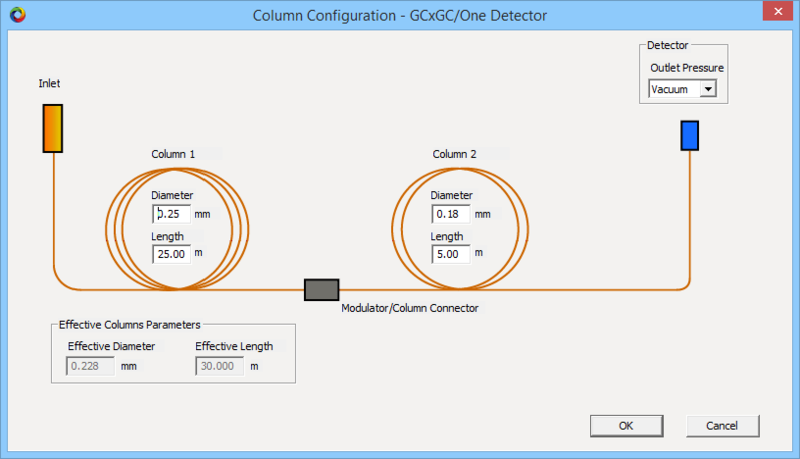 Evolution Workstation calculates the effective column length and diameter in order to ensure constant flow programming. A full control of a Deans’ Switch is now also possible with the OPTIC-4. An OPTIC-4 auxiliary flow module, 3/2 way valve and a SGE SilFlow™ Deans Switch Kit is all what is needed. The OPTIC-4 takes care about correct flow programming and the 3/2 way valve actuation. One of the possible hardware configurations is shown in the picture below. Deans’ Switch technology is used for heart cutting, inlet switching, column switching, detector switching, etc. Go to the Evolution Workstation software page for more information. The latest version of Evolution Workstation can be found here.